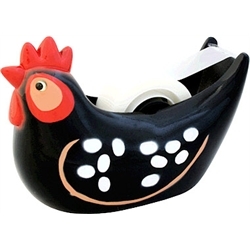 Today's giveaway is the Black Hen Tape Dispenser. That tape dispenser would match my kitchen timer which is about as savvy in decorating as I'm liable to ever get! Love watching our chickens--the snow took down our antenna but with the backyard poultry show we don't miss tv at all! Love it! I telecommute and love that I can go hog wild with my office decor. This hen would go great right next to my frog pen holder! This would be perfect for my son Jaeson's work area! He's turning 8 in 3 weeks and he's constantly making "books" about our Silkies... and constantly taking my desk's tape dispenser to do this. He needs his own! My 6 year old son (the chicken whisperer) would adore this! He s always searching for his tape and the only toys he takes great care of are his chickens. His tape would always have a roost. Too cute! I collect chicken/ducks in my kitchen - makes up a bit for the lack of poultry in the yard. Damn HOA. This blog is a great idea! I just found it through Mother Earth News email. I will check it often for cool tips on raising our 127 chicks which will arrive in about 10 days!!! The tape dispenser will remind me to check this blog when I have a chick-question! This tape dispenser is too cute! It would remind me everyday of my goal to raise my own chickens to enjoy their fresh eggs. My goal is to become educated enough that some day soon I may be able to raise a few chickens for the great goodness of the eggs. She would look so chic on my desk. My 6 year old chicken~loving daughter might lose her marbles with glee over this tape dispenser... but I'd take a chance. :) Just came across your blog this week! I grew up on a chicken farm. My folks still live there! My mom would get a kick out of this tape chicken! I love this! It would look great on my desk and remind all of our employees how wonderful I am for bringing in fresh eggs for them every week! :-) Love my girls! This would be the first piece for my new cleaned up office space that my wife has finally, finally gotten me to declutter, beside I am a Chicken Man!!!!! I have a friend that decorates her home with chicken decor. This would be a great gift to give her. I love our backyard chickens, and think it would be fun to bring that decor inside. I would have to give this to my best friends daughter - that little girl is the biggest chicken-whisperer in the world. She even sleeps with her book about chickens. I've ordered her the chicken purse and this tape dispenser would go great on her little craft table next to her new bag. That tape dispenser would be able to join the stuffed chicken already sitting on my work desk! This would go right on my desk! I've been adding a few chicken decor things around the house slowly. Adorable tape despenser! Would brighten up our messy office supplies greatly! My mom raises chickens and it would be a great addition to mother's day chicken gift basket I am making for her. The tape dispenser would be perfect for a co-worker who loves all kinds of birds, raises chickens, and supplies me with fresh eggs. I hope I'm the lucky one so I can surprise her!! I'd like to win because I think the tape dispenser is adorable! Hi! I keep chickens (14 at the moment) and would love this tape dispenser! It would certainly go with my decor (rooster-print kitchen curtains, assorted chicken doodads/trinkets everywhere), not to mention that it would brighten up my desk. It would make an interesting conversation piece, too- who would not want a chicken tape dispenser? Love it!! Thanks for the chance to win. I have 3 chickens (started out w/6 :( ). We have been getting eggs from all 3 all winter. I have shared several times w/friends. My kids enjoy "helping out" w/them. They produce eggs for us but are also our pets. That is sooo cute! I may have to start collecting chicken themed items with all of this cute stuff out there! I would rule the world if i had a supercute hen tape dispenser. A tape dispenser that makes you smile every time you use it. I'm fostering 4 growing chicks on the days my neighbor works out of town. Shared custody, until we finish the chicken coop. So I'm learning about chickens as fast as I can. My standard poodle loves them, and will be heartbroken when they leave, but they will return in the chicken tractor some times. She stood like a statue until I rescued one that escaped and ran directly under her. Now when they are in their dog crate, and confront her, she looks away from their stare, to say, "I am not a threat."